FINALLY… the sun is out and the temperature is nearly 50 degrees. After a week of cloudy, icy, dreary weather, I am more than ready for Spring! Public schools in our area were open one day this week. Monday was President’s Day and Tuesday through Thursday were snow days due to freezing rain. One good thing about such nasty weather is it provides perfect reading conditions. I perched myself on the couch next to the fireplace, cozied up with my fleece blanket and a hot cup of tea, and finished two books! 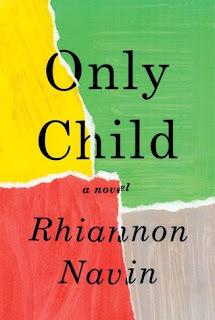 Only Child the debut novel by Rhiannon Navin. This is the story of (yet another) mass shooting at an elementary school as told through the eyes of first grader, Zach Taylor. Given the recent horrific events at Marjorie Stoneman Douglas High School in Florida, I’m not sure I could have finished this book if it were written any other way. But there is something about the pure innocence and sweet truth of a young child trying to make sense of this senseless act that made the reading bearable. And this story needs to be read. While the book focuses on Zach’s point-of-view, it does demonstrate the far-reaching repercussions of one person’s evil actions. Survivors are forced to deal with the tragedy, and yet how they handle the aftermath will, in turn, affect others. Raw emotions are laid bare and hidden secrets exposed. Life in the community is shattered and it will take time to heal before a new normal can develop. While the book wraps up a little too nice-and-neat… I suppose it is a fitting way to show a ray of hope for this family torn apart. After reading such a heavy subject, I thought I might choose something a bit lighter for my next book. 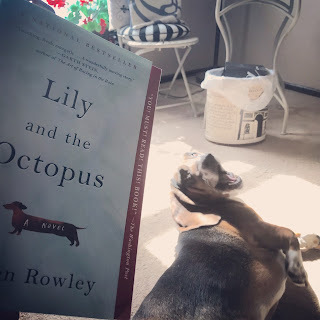 Lily and the Octopus (by Steven Rowley) had been on my bookshelf for months and as an avid fan of Crusoe the Celebrity Duschund on Instagram, I was ready for a bit of humor. On the one hand, the book did not disappoint. The author absolutely nailed the voice of Lily – or what I would expect to be the voice a Daschund. Every time she spoke (which was quite often since the author carried on daily conversations with his canine friend) she would speak in all caps with each word punctuated by an exclamation point. Seems like the perfect translation of that breed’s style of staccato barking to me. On the other hand, however, this book was almost more upsetting than Only Child. Lily is, of course, the Daschund, and the Octopus is a malignant tumor on her head. I don’t need to give any more details for you to know where this story is headed. I almost didn’t finish the book, but someone told me that the ending was happy, so I persevered. I disagree with that’ reader’s definition of happy. I would say the ending is satisfying … and does a good job of showing how life goes on despite our grief. It was not, however, happy. In fact, I started crying on page 249 and didn’t stop until thirty minutes after I closed the book. You can be sure The Basset received a double portion of hugs and kisses that afternoon. I spent quite a bit of time on BookTube this past week. I’ve discovered walking on the treadmill while watching videos is a great way to multi-task. Through my extensive viewing, I learned of a new book challenge: #MarchMysteryMadness. It’s been years since I’ve taken part in a reading challenge, but with my newfound love of psychological thrillers, I think I might give it a go. I plan to make a video this week showcasing the books I “might” read… although I’m not quite ready to fully commit 😊 I often fall victim to fickle reading moods. I do think this challenge might be the perfect time for me to try Stephen King. I am embarrassed to admit I have only read his writing memoir – and his historical fiction novel, 11/22/63. If you read and enjoy this master storyteller, which book would you recommend I read first? That’s a lot of cold weather. I’m glad you are able to read during this sort of weather. Maybe you should pick a truly happy book next? We rarely have that kind of weather but I can see how that's an upside to it. Only Child sounds like a really tough read. I agree with Deb – maybe a happier book – whatever that means to you. Ha! I plan on reading Only Child as I've heard positive reactions to it. I'll have to be in the mood though. Stephen King – well, I was a reader of his in my earlier days – like college in the mid-70's. Actually, my favorite book of his is The Stand – epic battle of good vs. evil. However, it's long, very long. That's my suggestion though if you have a block of time. Hope you have a good week and hope your spring is just around the corner! We've had a lot of rainy weather around here, which is also great reading weather! I read the kind of books last week that I like to call "cozy books" because I think that's the perfect kind of book to read in bad weather! It is tough yet well-done. Today we are enjoying bright sun and warmer temperatures… YAY! !